Sewn up. Over. Done and dusted. That was the Championship, or Division One, as it was formerly known, this time last year. It had been pretty exciting; a two-way battle between Partick Thistle and Greenock Morton. Yes, that's right, Morton. But 12 months ago, with two fixtures remaining, Alan Archibald's Jags had already sealed it with a tidy 2-0 victory away at Falkirk. You might have heard the horn-honking. 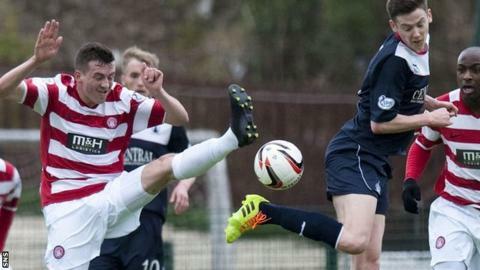 Hamilton Accies, Dundee and Falkirk have taken that 2012-13 excitement and raised it. In fact, it's still rising. Three teams. Two games to go. Two points separating them. One automatic promotion place. The next 180 minutes of action is going to be dynamite. Adding to the drama is a pressing sense of timing since Rangers and Hearts will be strong favourites for top spot in the second tier come next term. But let's just enjoy the present for now. Hamilton lead the way with their array of teenagers beavering away to create opportunities for a combined strike-force, part-French-part-Trinidad & Tobago, of 66 years of age. Jason Scotland and Mickael Antoine-Curier may have lost a yard or two of pace but they have both pitched in with vital goals and Alex Neil's charges have gone 11 games unbeaten at an ideal time of the season. The South Lanarkshire town is the eighth-highest populated in Scotland but crowds average just 1,400 at New Douglas Park - the only disappointing note as Accies seek a way back to the top flight - a division they spent three consecutive seasons in as recently as 2008-2011. Paul Hartley is from Hamilton and started his playing career there. But Dundee is his sole concern now and his task is to ensure the Dark Blues only have a one-season hiatus from the premier tier they were relegated from under John Brown last year. At 4.57pm in Greenock on Saturday past, Hartley said: "We'll just have to win our last two games and see where that takes us." The problem is, that might be nowhere if Hamilton do likewise. For Dundee relinquished the upper hand by losing at the unlikeliest of venues - Cappielow, the port-side home to a listless Morton. Next for Dundee is a trip to Hartley's former employers Alloa, whom he left for Dens Park in February, having enjoyed two successive promotions with the Wasps. As is having a tattoo of Kilmarnock's club crest on your leg when you're not there any more, like Falkirk manager Gary Holt has. Long socks or tracksuit bottoms might have kept that remnant from Killie's 1997 Scottish Cup win below the radar. A bit like the Bairns' title push. Falkirk wintered well, going through the whole of November, December and January without losing a league match. But it's five wins from their last five that has propelled them into contention. Five Rory Loy goals in that stint haven't done any harm either. At 26, this previously injury-ravaged Dumfries lad has now scored more goals for Falkirk this season than he has for all of his previous clubs put together. And it might win him Championship player of the season, if not promotion or an attractive move elsewhere. Neil is 32-years-old. At 37, Hartley is on the sidelines when many still play. Holt is 41 but still a relative infant in managerial terms. All three look like having promising careers ahead. Also, for the teams finishing second, third and fourth there are the newly-introduced play-offs, which promise to unlock further levels of tension and excitement. And finally, four games against both Rangers and Hearts await those who fail to go up. Maybe promotion isn't such a good idea after all.